As many of you know, Scott Boulevard Baptist Church (SBBC) will soon be closing its doors. Membership has been declining for many years and has dwindled to the point that the congregation can no longer sustain the facility and the property. Last year, after exploring many options and careful consideration, SBBC began looking for a buyer. Atlanta-based Fuqua Development has had this property and all 9 homes on Barton Way under contract since early 2013. 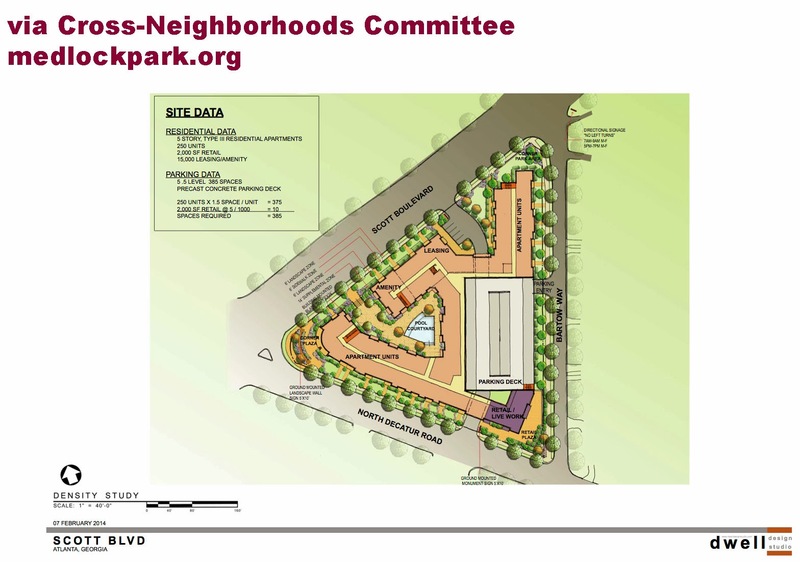 In June of 2013, MANA became aware of their plans to redevelop the property as a mixed used development (earlier site plans can be viewed here) and these plans were shared in a Community Meeting in July, 2013. After taking some time to think about what makes the most sense at this busy intersection and envisioning this project in a larger context of redevelopment, Fuqua Development is now proposing the project detailed below, which includes apartments, townhomes and limited retail as Phase 1 (Figure 1) of their larger vision (Phase 2, described later in this article). with Fuqua and that would be replaced with townhomes. Scott Blvd. appears in yellow. Click to enlarge. After multiple deferrals, feedback from Dekalb County Commissioners and the Cross Neighborhoods Committee* and many plan modifications, I can report that Fuqua Development has decided to move forward in their efforts to rezone the Scott Boulevard Baptist Church site as well as 9 homes on Barton Way in order to redevelop the properties. You should expect to see this rezoning on agendas in the next cycle which includes the Community Council 2/24/14 (rescheduled due to weather), the Planning Commission Meeting on 3/4/14, and the Board of Commissioners on 3/25/14. 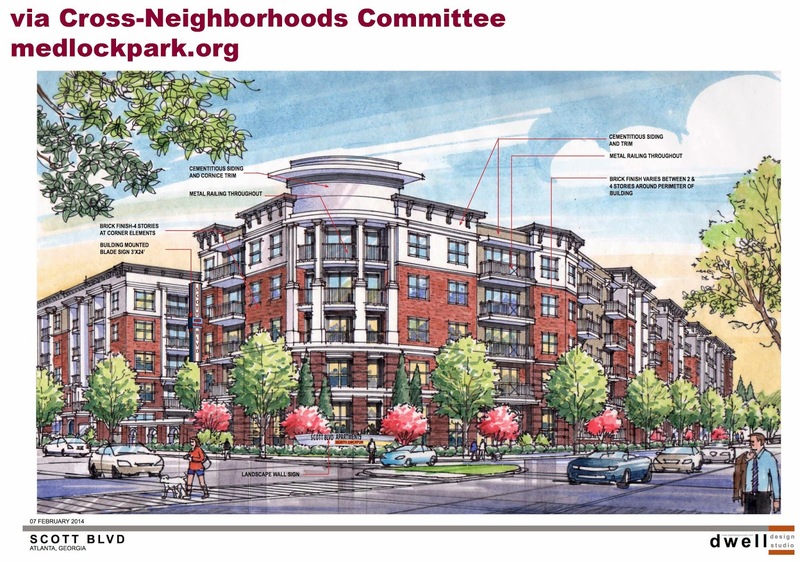 In this latest plan, Fuqua’s vision includes a walkable, new urbanism-inspired development that includes a 5-story (250 unit) apartment building angled into the corner of North Decatur Road and Scott Boulevard (Figure 2). The building features high quality materials and was designed to maintain a landmark presence on the corner. The building will include 2,000 square feet of street-front retail space on North Decatur Road, which will house a neighborhood-oriented space such as a coffee shop. This development will also include a parking deck for tenants with a small portion of parking allocated to serve the commercial space. Figure 2: View from Scott Blvd. and N Decatur Rd. corner. Click to enlarge. Figures 3-5 below provide additional details of the site's layout and proposed appearance. On the east side of Barton Way, 60 three-story townhomes are planned and would serve as a transition between apartment use and the single-family homes on Blackmon Drive if Phase 2 is not completed. Figure 3: Proposed structures for Phase 1. Click to enlarge. 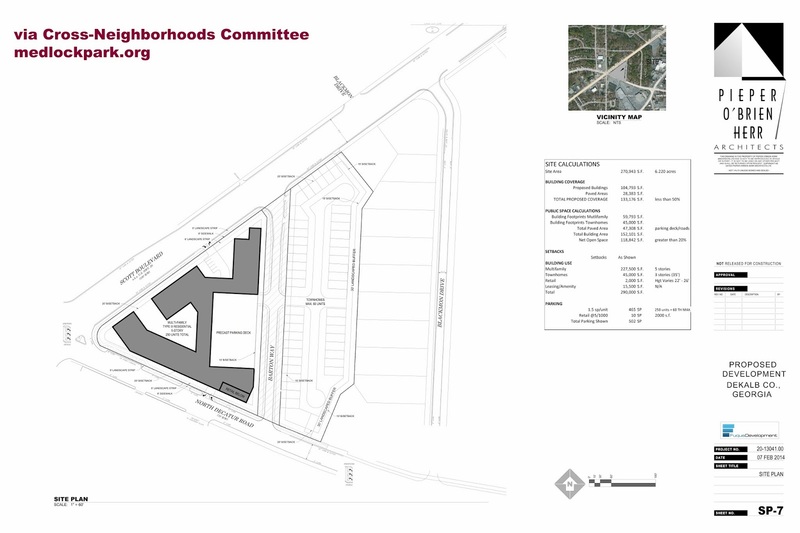 Figure 4: Close-up of residential and parking structures outlined in Figure 3 (SBBC parcel). Click to enlarge. Figure 5: Landscaping details for structures outlined in Figure 3 (SBBC parcel). Click to enlarge. 1. Design Limitations: Fuqua Development has agreed to use only brick, glass, stucco, stacked stone, cementious siding and aluminum on the apartment building and the townhomes. 2. 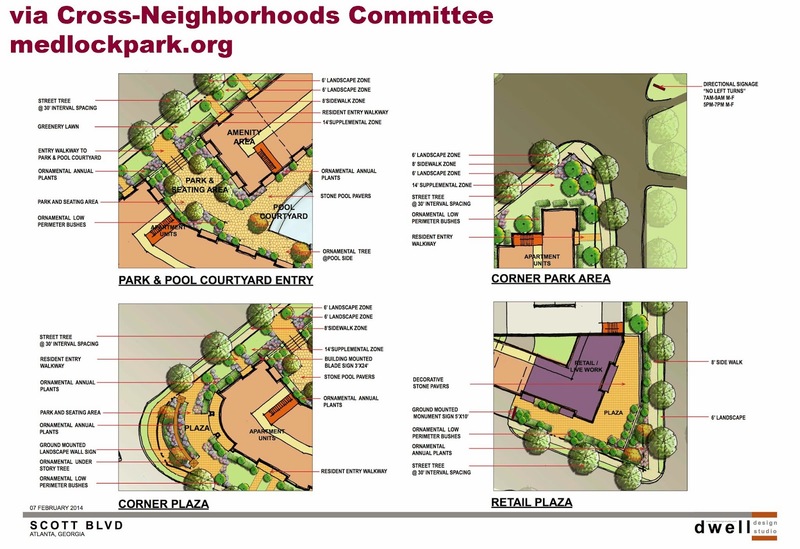 Significant Streetscaping and Landscaping: Fuqua Development has agreed to significantly landscape the perimeter of the project (see Figures 4 and 5). Though it is hard for most of us to imagine, Scott Boulevard and North Decatur Road frontages will be redesigned to initiate the transition to a pedestrian-oriented, walkable environment, which will complement streetscape design plans for Suburban Plaza. Starting from the curb, the Fuqua development will include a 6-foot, tree-lined landscape strip, a 8-foot sidewalk, a second 6-foot, tree-lined landscape strip, and up to 14 feet of additional hardscape, creating the feel of a pedestrian boulevard (Figure 5). A sidewalk also will be provided on Barton Way. 3. 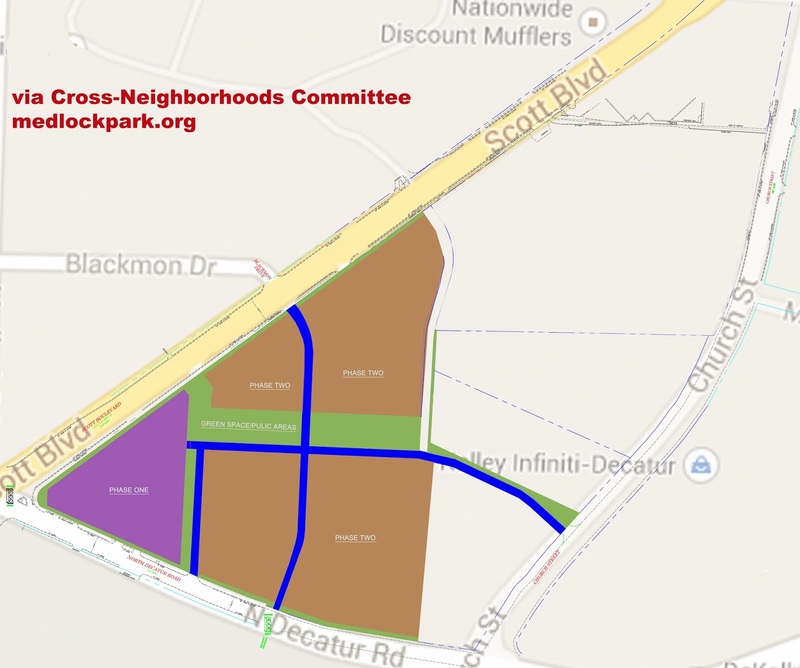 Restrictions on Site Access: Fuqua Development has agreed to limit vehicular access to the site from North Decatur Road and Scott Boulevard to right-in, right-out turns. 4. Upgrades to 6-point Intersection: As a result of MANA's Suburban Plaza redevelopment agreement, Selig Enterprises commissioned a traffic study to improve pedestrian safety and use at the 6-point intersection. The Wolverton traffic study suggested many improvements, some of which Patrece Keeter of DeKalb Traffic Engineering has successfully negotiated with GDOT. Fuqua plans to contribute funds to complete the remaining improvements. 5. Create Bus Stops: This includes creating an area for Emory's Cliff bus to safely stop along Scott Boulevard as well as a sheltered bus stop on N. Decatur Road for the MARTA bus. This is contingent upon necessary County and State DOT approvals. 6. Significant Restrictions on Townhomes: There are too many to list, but Fuqua has agreed to numerous zoning conditions to maintain the quality of life and property values of the single family homes on Blackmon Drive should they remain. Supporting our neighbors on Blackmon Drive is a priority for the Committee. blue areas) that we have overlaid on a Google map. The purple area covers Phase 1 as discussed above. Fuqua Development has designed this project to allow for a Phase 2 which could include but not be limited to the homes on Blackmon Drive, many of which Fuqua already has under contract. This phase (Figure 6) would allow for a more extensive redevelopment to include greenspace, retail, commercial, office and residential components including a new roadway network to improve transportation in the triangle formed by N. Decatur Road, Scott Boulevard and Church Street which would help relieve traffic congestion in the area. Many will be happy to hear that “the natural food store” hopes to locate in this portion of the development. If Phase 2 is realized, the townhomes along Barton Way would not be built. This area would instead become part of the more comprehensive plan. We realize this plan is significantly different from those published previously and is likely to inspire a wide variety of responses. If we must lose the church, most of us on the committee feel that apartments on the corner are a better use than the previously proposed commercial plan. With traffic such a major concern at this intersection, residential use drastically reduces the number of “trips” to and from this property as compared to commercial development in this same location. If we look at this as a larger plan, it makes sense to move the commercial component away from the already burdened 6-point intersection and use the apartments as a residential buffer from the more intensive commercial and office uses. One of the benefits of any redevelopment at this site is that Dekalb County will require the property to have proper stormwater management – likely in the form of an underground water vault. In an area where flooding is a major issue, it’s worth noting that simply bringing this site up to current code will drastically reduce or eliminate the runoff from this property. We know many of you will ask, "why this property when there are so many other commercial properties available in the area?" While that is a question to better ask Fuqua Development, it is important to remember that the SBBC property is for sale and in a prime location, from a development stand point. It is this kind of investment in our area that will serve to stimulate growth and redevelopment along the commercial corridors. Development will certainly have both positive and negative affects for our community. This Committee is working hard to make sure that should this project move forward, it will add value to the larger community. We want to hear from you. 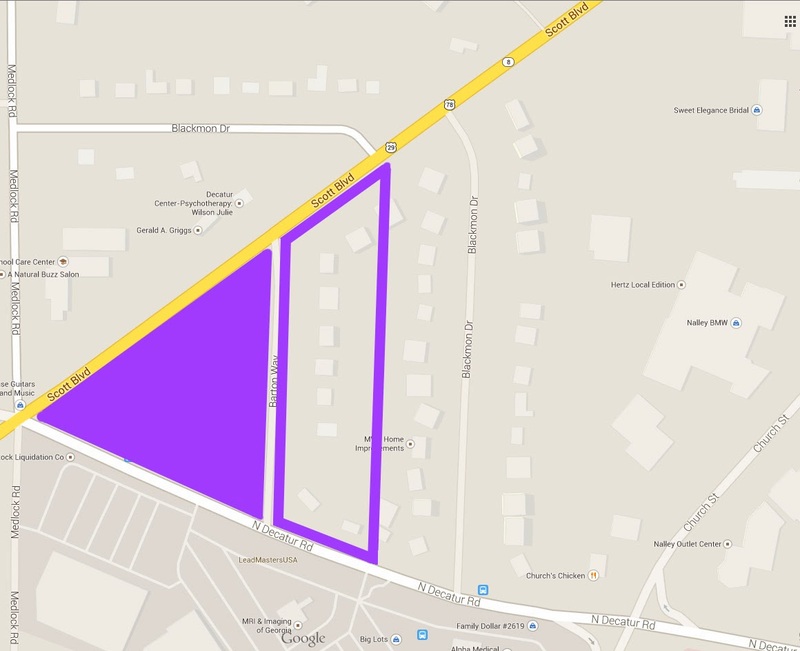 Fuqua Development has arranged a meeting at Scott Boulevard Baptist Church to discuss its plans in more detail on Wednesday, February 26 at 7:00 pm. We hope you will plan to attend. You can also contact your neighborhood representative or neighborhood association to provide feedback, or email crossneighborhoodscommittee@gmail.com. * The Cross-Neighborhoods Committee includes the following neighborhood representatives: Garrett Asay (Ridgeland Park Resident), Nancy Fox Ciliax (Corresponding Chair, Clairmont Heights Civic Association Board), David Duncan (President, Medlock Commons Homeowners Association), Todd Link (Springdale Heights Resident), Debra Robinson (Blackmon Drive Resident),Theresa Same (Zoning Chair, Medlock Area Neighborhood Association), Mary Shellman (Steering Committee, Good Growth DeKalb), and Deanne Thomas (Decatur Heights Neighborhood Association Transition Team). Fuqua is represented by Jeff Fuqua (Principal, Fuqua Development), Heather Correa (Partner, Fuqua Development) and Dennis Webb (Attorney, Smith, Gambrell and Russell).